Fresno, CA- The holiday season is officially underway, and with sleigh bells, carols, décor and more, comes festive holiday get-togethers. No matter the occasion, it’s all about the food, drinks, and of course, the fun! However, it can be challenging to contribute something that truly stands out in the crowd. The key to quick and easy holiday entertaining is likely already in your pantry: California Ripe Olives. Mild, buttery and delicious, California Ripe Olives are right at home on the holiday menu – from libations to light bites and even the desert table, too. Cocktails are often at the center of holiday get-togethers, and for elegant celebrations, Freda’s Martini is a great choice. 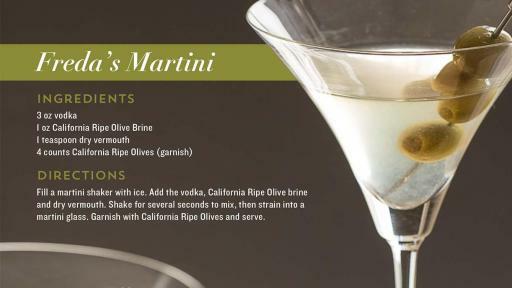 Named for Freda Ehmann, who developed the curing process for California Ripe Olives in the 1800s, this cocktail is classically delicious with just the right amount of pizazz. 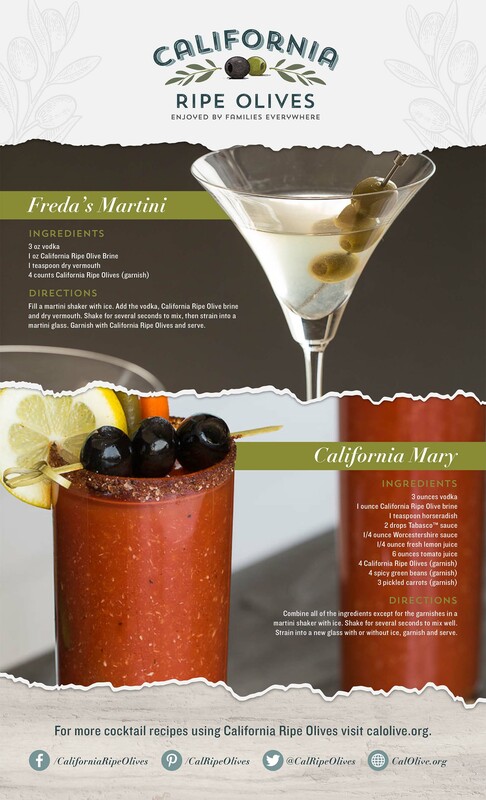 Or, to liven up the New Year’s Day celebration brunch menu serve up a California Mary or two, in honor of National Bloody Mary Day. Horseradish, spicy green beans and California Ripe Olives, are just a few ingredients that come together to kick-off a great year ahead. When it comes to light bites, bold flavors that satisfy every taste are the way to go. 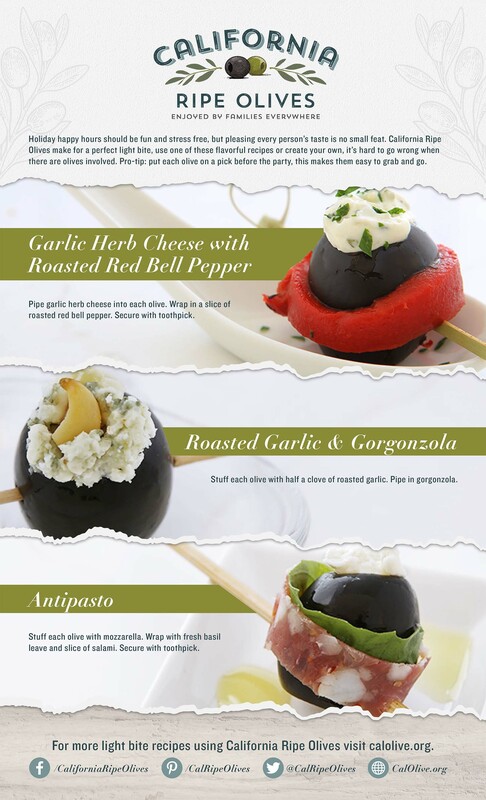 Stuffed, glazed or wrapped, California Ripe Olives offer exactly what your guests are looking for. Glaze them with honey, miso, garlic or other bold ingredients for a quick and yummy bite. Stuffed olives are easy to make, and even easier to eat. 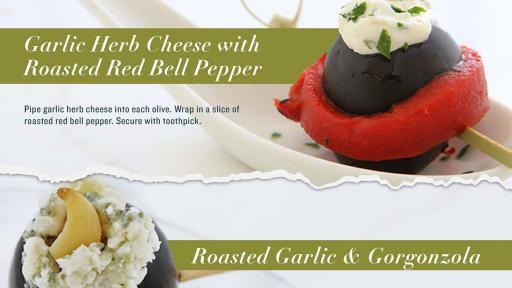 Try California Ripe Olives with roasted garlic, mozzarella or salami for an extra serving of yum. What’s a party without dessert? 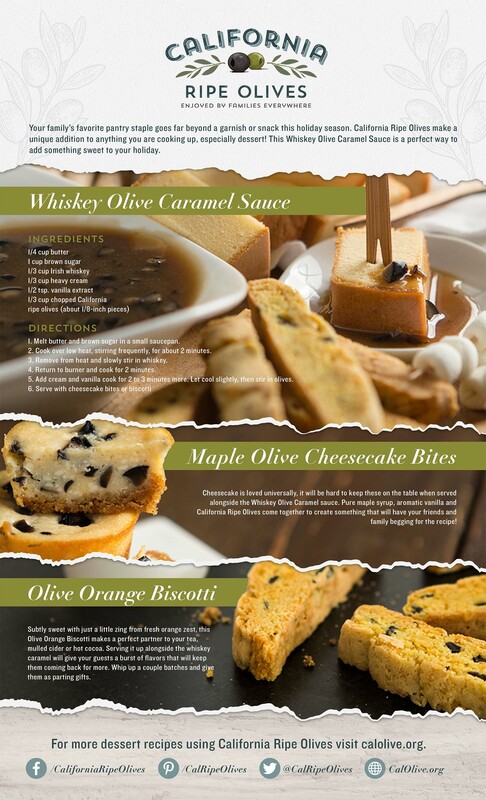 The mild and buttery flavor of California Ripe Olives can add something magical to sweet treats, including Maple Olive Cheesecake or Olive Orange Biscotti. 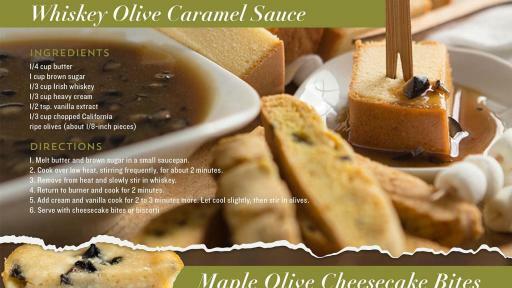 When California Ripe Olives are paired with the rich taste of caramel and whiskey, you’ve got a Whiskey Olive Caramel Sauce that your guests will want to dip into again-and-again. Libations, light bites, or desserts, California Ripe Olives are ready to be your oh-so-tasty ingredient for elevating your holiday season. And, one more festive fact, more than 95% of the country’s olives are grown in California. Generations of family farmers and processors make it their mission to ensure that from planting to harvesting, curing and canning, only the best product makes it to your table at the holidays and all year long. For more recipes using California Ripe Olives and to read the stories of California Ripe Olive growers, visit CalOlive.org.